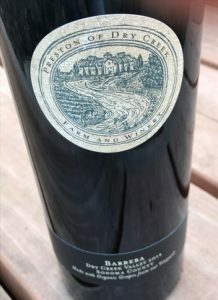 This weekend, my husband and I put the convertible top down on a glorious spring morning and trekked 30 minutes to Preston Winery to purchase some aforementioned epic wine. We attended a wine dinner at Preston Farm and Winery a few months back and bought some wine as anyone is wont to do after an evening of copious libations. Often, the wine doesn’t live up to the deliciousness in the memory when you open it later. Ever notice that? Context is everything. The 2014 Preston Barbera, however, most certainly did. We opened said bottle a few nights ago and were so blown away, we immediately planned the voyage north to Dry Creek Valley. Barbera isn’t a grape plastered all over many California bottles. Far from the ubiquitous Cabernet Sauvignon, Chardonnay or Pinot Noir, the native Italian Barbera grape is rare in these parts. So it checks the box on geek factor for sure. Plus the food-friendliness column. Generally high in acidity and lower in tannins, Barbera brings juicy fruit and versatility to a glass. Imported first to California in the 1880’s, as of 2010 we had only 6,800 acres planted to this grape (compared to 88,000 of Cabernet), mostly in warmer areas like Sierra Foothills and Dry Creek Valley. Apparently, there are 60 wineries producing Barbera in the state but the best ones I know include Seghesio Family Vineyards and Boeger Winery. Offers up a lush, gorgeous sip of wine, with a fruity finish for days. Look for plush raspberry, blackberries, red plum and a slight hint of vanilla oak. And serious deliciousness. Like other Barberas, it sports wonderfully food-friendly acidity but is also balanced enough to enjoy alone. The night we re-fell in love with this wine, we paired it with roasted spaghetti squash slathered in grass fed bolognese sauce. Winner, winner, weeknight dinner. It runs $33 per bottle so not the every day grog but well worth every penny, IMHO. It’s unfortunately only available through Preston’s Website. Again, worth the effort. 842 cases made. Did I mention their Barbera is organically farmed? Preston is an amazing place to visit… sheep roaming around, full organic vegetable garden and a casual atmosphere. To completely immerse yourself in California Barbera history and cultivation, see this article from UC Davis.